Central Federation of Real Estate Agencies KVKL (Kiinteistönvälitysalan Keskusliitto) organized its first international conference. The event took place in Helsinki on last March 17 and focused on the Finnish real estate market in a European and international perspective. A success. Xavier Ortegat represented the CEPI network at this event, introducing main challenges for the business from a European perspective and sharing first conclusions of the yearly CEPI report on market developments. Kirkor Ajderhanyan was representing the French association FNAIM and informed about a successful initiative to develop an international platform for French professionals and FNAIM affiliates. The Delegate of the National Association of Realtors to Finland, Howard J. Leino, briefly reported on the recent market trends in the US. Finland’s Minister of Housing, the head of the national statistical office and many professionals attended the event and were offered a platform to share and check experiences both at national and international level. 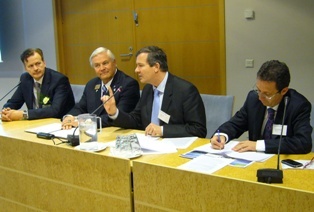 "It is encouraging to see that some national associations such as KVKL and some actors like Jukka Malila take resolute action to answer international challenges of the real estate business, develop new services to their affiliates and ask CEPI to be facilitate links and contacts to other players in Europe", said Xavier Ortegat. A lack of regulation of the property professions Europe wide, complexity of legislations and regulations, concentration of actors, multiplication of services and service providers, the increasingly international market environment and current housing market downturn challenge the real estate markets all over Europe. Differentiation, quality measurement, client orientation and bench marking represent key investments for property agents and professionals who wish to remain at the forefront of the business. Adequate and supportive regulation, both at national and European level, needs to give support to new opportunities in the market and enable smaller markets such as Finland to benefit more fully from their comparative advantage in the international arena. The feedback of participants in the event is encouraging and supports the idea of a second edition in 2011.